In Salesforce, relationship fields – such as Lookup, Master-Detail, or Hierarchical – allow a customer to connect one object with another object. Now imagine a use case where a customer wants to connect one object with multiple objects – i.e., relate a child object to multiple parents objects. In this blog, I will guide you through the process of, understanding and using, polymorphic relationship to relate a child object record with multiple parent objects. We will discuss, how we can use Process Builder to update parent object in case of the polymorphic relationship. So let us get started. Suppose you want to connect an object with multiple parents objects – Student (child), College (parent) and Account (parent). Via a Lookup, or a Master-Detail, relationship, you can either connect a Student (child) record to a College (parent) record; or a Student (child) record to an Account (parent) record. Now imagine a use case where you want to relate the Student (child) record to multiple parent records simultaneously – for example, a Student (child) record to a College (parent) record and an Account (parent) record. If this is the case, then, you need to use the polymorphic key, to relate a child record, to multiple parents record. Another example of the polymorphic relationship is Whoid and Whatid fields on the Event object. The WhatId field of an Event could be an Account, a Campaign, or an Order. To summarize, when a field has a relationship with more than one object, it is called a polymorphic relationship. Using a Polymorphic Key, you can relate a single (child) field to multiple parent records – be it Account, Contact, Order, Quote, etc. For example, if you have Queues enabled for Leads, a Lead Owner can be either a User or Queue. A glance at the following image shows how a polymorphic key – refer to right image below, ‘With Polymorphic Key’ – significantly streamlines an object mapping process. 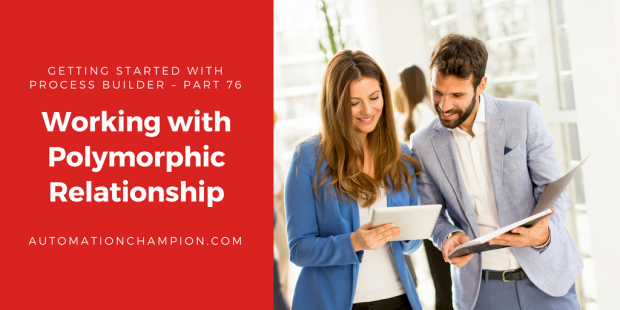 As of now, the polymorphic relationship field is only available in the standard object and it is not possible to create a polymorphic relationship for custom objects in Salesforce. Read the rest of this entry! Have heard about, and implemented, Shield Platform Encryption (SPE), Right? No? No worries – Trailhead is at your rescue! Trailhead has an amazing module Get Started with Shield Platform Encryption. The module will teach you the ins and outs of platform encryption! 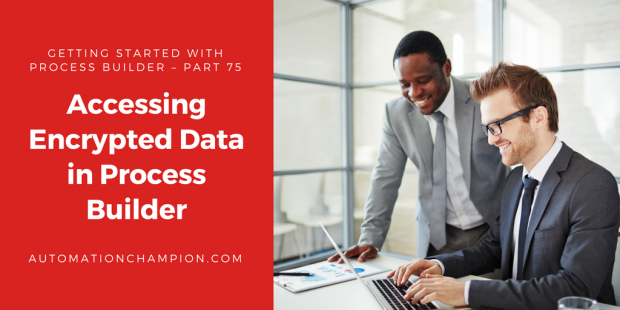 In this blog, my primary focus is to show you how we can use Process Builder to access encrypted data. But before we explore this concept, let us take a closer look at Platform Encryption. To state briefly, Platform Encryption gives your data a new layer of security while preserving most of the Salesforce functionality you rely on. It enables you to encrypt sensitive data at rest – and not just when transmitted over a network. As a result, your organization can confidently comply with regulatory requirements, privacy policies, and contractual obligations for handling private data. One of the salient features of SPE is that it helps you to build on the data encryption options that Salesforce already offers out of the box. Data stored in many standard and custom fields, and in files and attachments, are encrypted using an advanced Hardware Security Modules – based key derivation system. As a result, the data is protected even when other lines of defense have been compromised. Another critical feature of SPE is that your data encryption key is never saved or shared across organizations; instead, it is derived on demand from a master secret and your organization-specific tenant secret. And then, the key is cached on an application server. Preceding screenshot displays how fields get encrypted when SPE is enabled for an object. People with the View Encrypted Data permission can see the data of encrypted fields. You can control it by implementing Permission Set. Please note, if you enable Turn Off Masking for Encrypted Data – Critical Updates then, field masking will be decoupled from SPE. As a result, the View Encrypted Data permission, and its resulting masking behavior will no longer be available in SPE. As a result – of enabling ‘Turn Off Masking for Encrypted Data – Critical Update’ – now you have to use field-level security and object-level security features to control who can Read the rest of this entry!